Note: Click on the title (above) to be redirected to a website that defines PDD-NOS. 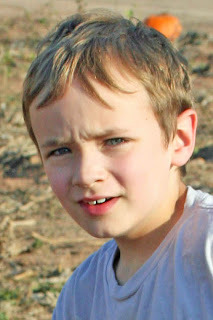 A bit about Cameron before I make my list: He is almost 8 years old and was diagnosed with Pervasive Developmental Disorder-Not Otherwise Specified (PDD-NOS) when he was 3. He was a very mellow baby and toddler who hardly cried, even though he had severe reflux/GERD. As the younger brother of Noah, who was diagnosed with Asperger's Syndrome, we thought Cameron was a neurotypical child. That is, until his first day of preschool, when the teacher suggested he be screened for autism! The in-home therapists working with Noah at the time also recognized some signs of autism in Cam. He has continued to become more and more obviously inflicted with autism. 1. He has a contagious laugh. We say he has "a laugh that could melt a snowman." 2. He has a cute cleft chin like his dad. 3. He has beautiful blue eyes -- everyone else in our family has green. 4. He sleeps with a yellow bear called Lemon Poppyseed, which is nicknamed "Poppy." 5. He has an awesome memory, especially associated with scents. 7. He loves to show his parents things he makes. 8. He is an excellent train-layout builder. 9. He likes to eat "The Cameron Sandwich," which is wheat bread with cheese, pepperoni, pickles, lettuce and mustard. 10. He loves his dog and is learning to play with him. 11. He enjoys playing outdoors in any season. 12. He's a "tough kid" who doesn't cry much when he is hurt or sick. 13. He has a lot of energy. 14. When he's really happy or excited, he does this hop-dance move. 15. He asks a lot of questions about what things are, how things work, why things are the way they are, etc. 16. He likes to find out what a word means and then practice using it in his everyday speech. Sometimes it takes some practice to use it correctly, which can be so cute. For example, he thought the word "likewise" meant "yes," so he would answer your yes/no question that way. 17. He is very expressive about the things he likes. He likes to talk to people a lot. 18. He still climbs in bed with his mom and dad sometimes. 19. He likes to decorate our house, especially at Christmas time. He also likes to arrange the items in his bedroom. 20. He likes to go shopping sometimes with me! 21. He has started taking better care of his teeth. 22. He asks me for permission before playing Wii or computer games. 23. He is excellent at Nintendo Wii Cars Mater-national (racing game), which he does standing up and jumping around -- great exercise! 24. He loves to look through the scrapbooks I have made. 25. He loves to watch our home movies. 26. He has started talking about his school friends, and his teachers say he is getting better at playing with them. 27. Sometimes in public he is able to ignore noises he doesn't like. 28. He loves spending weekends at his grandma and grandpa's. 29. He has an innocent, naive quality about him that most 7-year-olds have already outgrown. Since he's my youngest and last child, I am enjoying his little-kid qualities so much. 30. He is really funny. He loves to make people laugh. 32. During our family Bible studies, he reads the Bible aloud and has clear, excellent diction. 33. He likes to have one-on-one days with me, and he'll say, "Mom, I'm enjoying this date we're having." 34. He transitioned pretty well to a new school this year, including a new support teacher after having the same one for 3 years. There's more, but that's good for now!